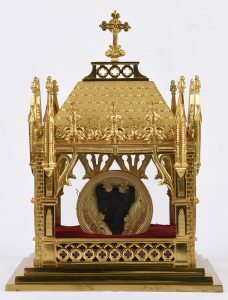 The major relic of St. John Vianney, his incorrupt heart, is displayed for veneration in this reliquary. The schedule for the Heart of a Priest Pilgrimage of a major relic of St. John Vianney, patron saint of parish priests, in West Virginia during Holy Week has been announced. The saint’s incorrupt heart will be present for the celebration of Chrism Masses in both Wheeling and Charleston, and will be available for veneration. Father Brian Crenwelge, assistant director of Vocations for the diocese who is coordinating the relic’s visit to the state, said this is a privileged opportunity for all in the Diocese of Wheeling-Charleston. “With all the tribulation happening in our diocese and the church right now, we need to be reminded of what it means to be a true priest of Jesus Christ, and this visitation of this relic of this saintly priest will help to do that,” Father Crenwelge said. Auxiliary Bishop William J. Waltersheid of the Diocese of Pittsburgh will celebrate the Chrism Mass at the Basilica of the Co-Cathedral of the Sacred Heart in Charleston on Monday, April 15, at 4 p.m. Archbishop William E. Lori of Baltimore and apostolic administrator of Wheeling-Charleston who is also supreme Chaplain of the Knights of Columbus will celebrate the Chrism Mass at the Cathedral of St. Joseph in Wheeling on Tuesday, April 16, at 4 p.m.
On both days the relic will be available for veneration from 9 a.m. through to the completion of the Chrism Mass beginning at 4 p.m. The relic will be available for veneration throughout the day, but a few events have been placed at each location as well. For both days: 9 a.m. – Solemn Entrance of the Relic; 9:05 a.m. – Solemn Lauds (Morning Prayer); 2 p.m. – Eucharistic Holy Hour for Vocations to the Priesthood; 4 p.m. – Chrism Mass with diocesan priests concelebrating. Father Crenwelge said that priests who will be coming to the Chrism Masses are especially encouraged to come early for the Eucharistic Holy Hour. Father Crenwelge thanked all for helping spread the awareness of this sacred opportunity and thanked Msgr. Kevin M. Quirk, J.C.D., J.V., rector of the cathedral, for arranging the relic’s visitation to West Virginia. For more information, contact Father Crenwelge by e-mail to bcrenwelge@dwc.org. St. John Vianney, the holy Curé of Ars, is depicted holding and pointing to a crucifix, indicating that Christ is the center of his life. Icon by Fabrizio Diomedi, commissioned by the Supreme Council (2018).